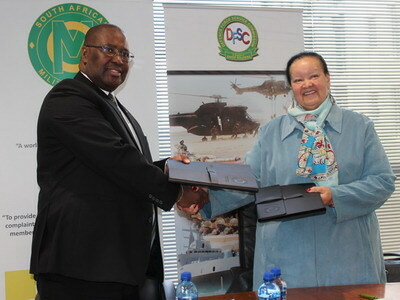 The South African Military Ombud Office and the Defence Force Service Commission (DFSC) on 5 July signed a memorandum of understanding (MoU) covering cooperation for their mutual benefit. The two institutions share a common goal as they deal with conditions of service of members of the South African National Defence Force (SANDF), the Ombud’s office said. The Office of the Military Ombud is a statutory body established in 2012 to investigate complaints lodged by either current or former members of the South African National Defence Force regarding conditions of service and complaints lodged by the public regarding the conduct of members of the Defence Force. The Defence Force Service Commission is mandated to make recommendations to the Ministry of Defence and Military Veterans on improvements of salaries and service benefits, on review of policies in respect of conditions of service, and promotion of measures and setting of standards for efficient and effective implementation of policies for members of the South African National Defence Force. Part of the agreement is that “where a Party receive a complaint, which falls within purview of the other party’s mandate, receiving Party shall refer the complaint to the other Party for consideration or may refer the complainant to the said Party for further assistance”. Where the allegations which form the subject matter of the complaint has partial application to the mandate of either party, the Parties shall decide in the interest of proper and effective investigation of the complaint, the party that can best investigate the complaint or to conduct a joint investigation, as the case may be, the Ombud’s office noted. Military Ombud Lt Gen (Ret) Temba Matanzima said he is pleased with the agreement between the two institutions as they are the watchdog of the Department of Defence and Military Veterans in the country. “The Commission is a strategic partner and we are confident that this agreement will benefit our strategic stakeholders which is the members of the military.” said Matanzima.